On left, Larry Wash and Kelly Leitch from KONE Americas, alongside Geoffrey Matthews and Chris Mallinos, leaders from Great Gulf, cut the ribbon at North Americas' first KONE JumpLift. The technology will enable faster and safer construction at Great Gulf's flagship condominium project in Toronto. KONE Inc, which describes itself as a global leader in the elevator and escalator industry, today announced the first North American installation of KONE JumpLift technology in One Bloor, Great Gulf’s flagship high-rise condominium under construction in Toronto. KONE JumpLift, which has already been installed in Europe, Asia, the Middle East, China and Australia, is an advanced, self-climbing elevator that operates during construction in a building’s permanent hoistway. KONE JumpLift uses a mobile machine room that moves upward as the construction progresses. The technology can improve safety and efficiency on job sites and can enable buildings to be completed months ahead of traditional construction timelines. 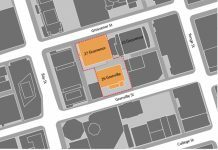 Great Gulf and KONE are collaborating on the project, which will deliver high-end retail and residential units in Toronto’s Bloor-Yorkville area, and is expected to be completed in 2016. On left, Larry Wash and Kelly Leitch from KONE Americas, alongside Geoffrey Matthews and Chris Mallinos, leaders from Great Gulf, cut the ribbon at North Americas’ first KONE JumpLift. 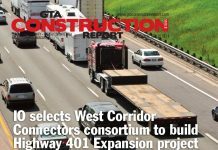 The technology will enable faster and safer construction at Great Gulf’s flagship condominium project in Toronto. Less Wait Time: Operating at speeds up to 800 fpm (4m/s), five times faster than a traditional external hoist used in construction, KONE JumpLift is able to move construction workers to their floors in a faster, safer way. Safer Transportation: With all transportation activities taking place inside in a dry and windproof shaft, construction workers can safely move throughout the building regardless of weather conditions, allowing building construction to proceed unhindered. Construction Efficiency: Using the building’s permanent elevator hoistway for construction use, completed floors can be put into action while allowing the installation to continue above. Faster Delivery: When the building structure is completed, changing over to the permanent elevator is a straightforward matter of installing the final machinery and finishing the material surfaces of the elevator car, landing doors and signalization. Next articleConstruction progressing on new Hamilton GO Transit bus storage and maintenance facility.